Business gurus come and go. But not Peter Drucker, who remains a towering figure, widely regarded to be the father of modern management and the world's most influential business thinker. Drucker's uncanny ability to codify management practices and predict future trends has ensured his lasting impact. His dozens of books include the landmark Concept of the Corporation and The Effective Executive, which remains a bestseller decades after its first appearance. 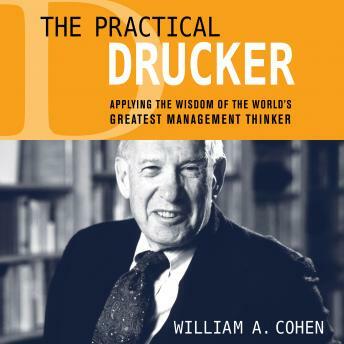 Drucker aimed high to illuminate the big picture of organizations, their people, and the global forces affecting them. As such, his focus on the "what to do" eclipsed the "how to do it" that managers and executives crave. Yet crystalline insights into "how" were always there. -And much more As a student, scholar, and longtime friend of Peter Drucker, author William A. Cohen is uniquely positioned to illuminate these timeless teachings of the management master, which resonate today with as much force and relevance as when they were first articulated.